With the release of a new operating system from Apple, a totally different image and video capturing format have been included for newer iPhones. The format is called as HEIF (High-Efficiency Image Format) and HEVC (High-Efficiency Video Coding) for images and videos respectively. HEVC is also known as H265 which is a successor of well known H264 MPEG-4 AVC. 1) Hardware: iPhone 7 or later and newer iPad models. Technically speaking, it needs at least A10 processor for the encoding-decoding process. 2) OS Version: iOS 11 and higher. This means iPhone 5s, 6s, SE and 6 running iOS 11 will not be able to capture images in this format. For iPhone 7 and later, the camera by default captures photographs in this format. 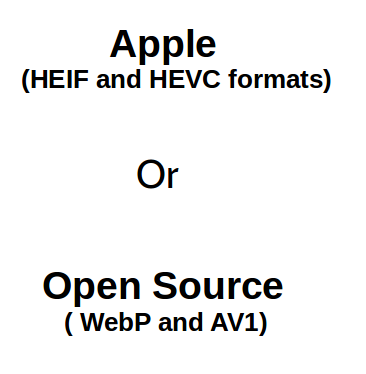 Background: Both HEIF and HEVC are not opensource. They have been known since summer 2015, but their adoption on the web has been low so far because of the huge licensing fees involved. The license can be obtained from individual patent holders who participated in JCT-VC or from licensing companies such as MPEG LA, HEVC advance and Velos media. HEIF and HEVC are not owned by Apple. When moving images to PC, iPhone converts them to jpeg images on the fly. This might be good for photographers who want to just copy files as fast as they can, but not so good for photographers who care about lossy compression. An iPhone user can actually prevent the camera from shooting in HEIF by going to camera option in settings and selecting "Most compatible" option. Let's talk about the good and bad sides now. Less storage space consumed for equivalent quality jpeg image. 1) Not many software or apps are able to handle HEIF format files as of today. So this might create some problems for photography folks. 2) If a smartphone photographer wants to shoot in Jpeg format, they lose 4k 60 fps and 1080p 240 fps video capability as well. This is a big turn off, at least for me. Apple doesn't want a user to take pictures in jpeg and shoot videos in high quality at the same time. With the adoption of HEIF by Apple, looks like there is an emerging rift between Apple and the open source world. A few years ago, Google developed an open source alternative image compression codec called WEbP. It can be considered as a competitor to HEIF format, and who knows Google might add something fancy to it in coming months. Technology giants such as NVIDIA, AMD, Amazon, Cisco, Google, Netflix and Intel are a part of Alliance for open media. AV1 is their upcoming open source video format to compete with HEVC. It is to be released by the end of 2017. In the end, it would be interesting to see how the AV1 codec performs in comparison with HEVC when it is released. In the end its a battle of HEIF vs WebP and AV1 vs HEVC. Do you think HEVC/HEIF is the future of image quality standards?